A new app, Gesture Calc has been added to the Marketplace. 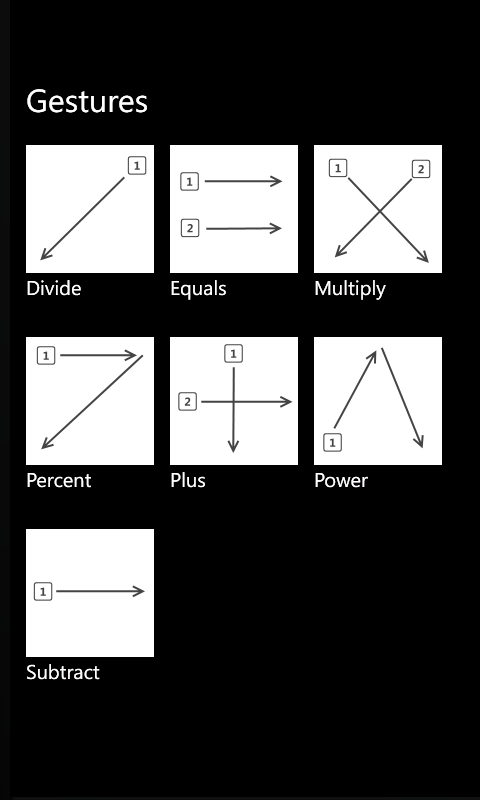 Gesture Calc is an experimental calculator app that uses gestures for operations like addition, subtraction, multiplication and division. The button layout is designed to have the phone held in portrait view with all the tapping done by your thumbs. 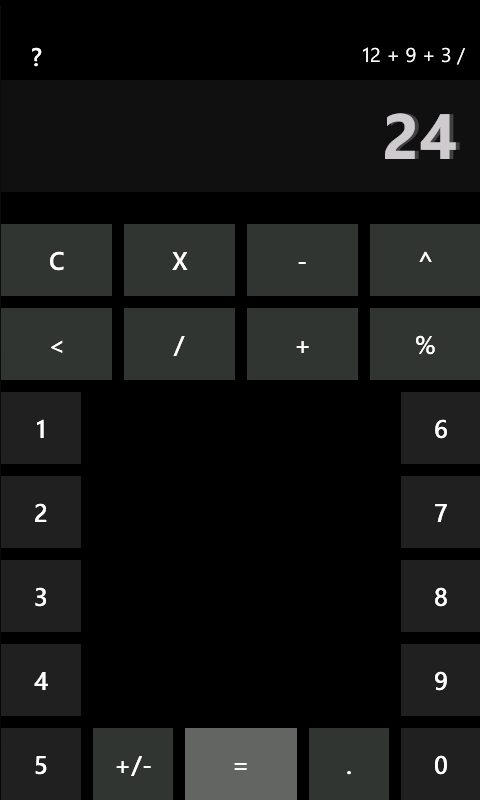 This puts all the functions of a calculator in a smaller space, and the gestures make a the calculator more satisfying to use on a touch screen. 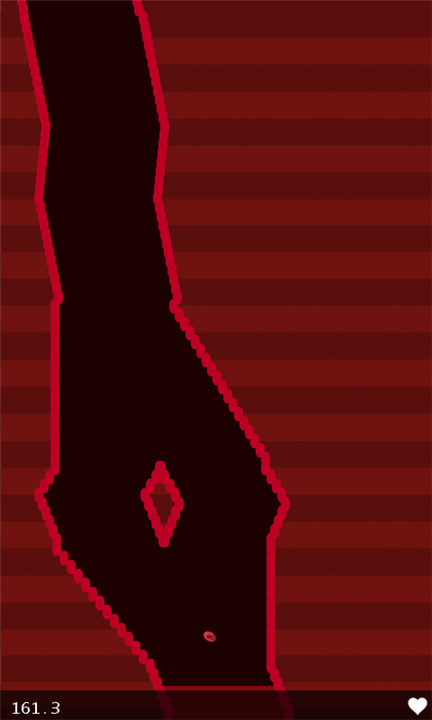 Also, operation buttons do appear at the top of the screen if you prefer them to gestures. The app is free, and can be downloaded from the Windows Phone Marketplace. 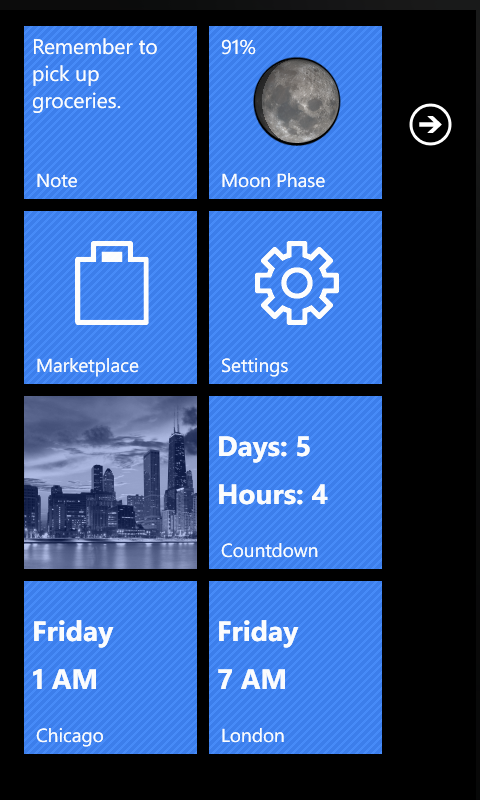 The latest version of Quick Tiles has been submitted to the marketplace for testing and will be available soon. As mentioned in an earlier post, this version will include a bulk template feature that lets you quickly set all your saved tiles to the same theme. 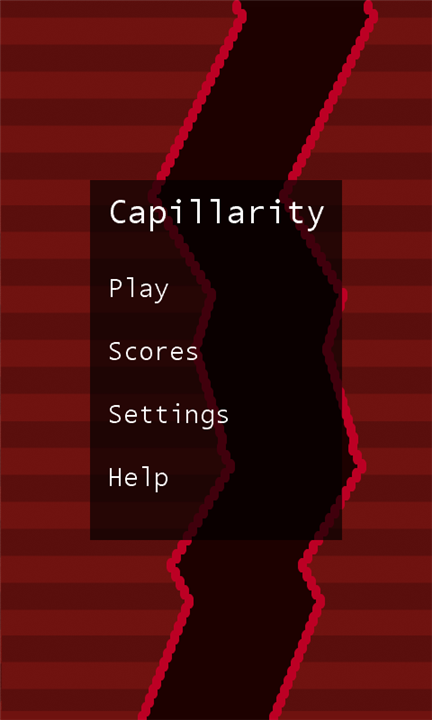 Korhaan’s tunnel racing game Capillarity, has been converted to a free app. This removes the 30 max trial plays limit, and now allows unlimited plays. Download it here. Although quick tiles comes with some good default backgrounds and effects, it may not have that perfect background you want. That’s you can add custom backgrounds from your phone’s media library. There are two quick sources for tile backgrounds, either images downloaded from the web, or pictures right from your camera. Open up Quick Tiles, and select the “Backgrounds” option on the home screen. Tap the “Add Background” button and select “Camera Roll”. Scale and crop to the desired size, then tap the checkbox to save it. After this, your custom background will be available as a background image. Custom backgrounds will appear at the bottom of the list of images when you choose the “Background Image” setting. Open up the phone’s web browser and surf the web for some pics to use. A website like flickr.com is a good place to start. Once you find an image you like, tap and hold to get a context menu. Select “Save Image” from the available options. 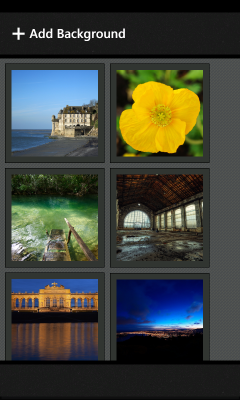 Tap the “Add Background” button and select “Saved Pictures”. Using these steps you can import any image you like into Quick Tiles. Here’s an example of some of the images you can add with this feature. Another neat trick for Quick Tiles is creating an etched text effect. This is available because of the Shadow Text settings you can apply to tiles. To create an etched text effect you need to properly choose the background color, text color, and shadow color. Specifically, you must pick a text color darker than the background color and a shadow color lighter than the background color. 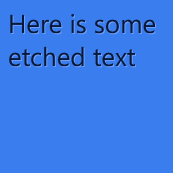 In this tip we will create a some etched text on a blue background. First, set the background color to a fully solid blue color of #3D81EE. 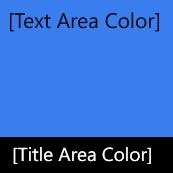 Next set the Text Color to a solid dark blue color of #32527A. Finally set the Text Shadow Color to a light blue color of #C3D9FF with 75% opacity. And that’s it, you now have created an etched text effect. 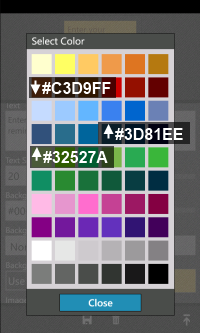 *Note All the colors used are quick colors and can selected using the color picker. Here is a screenshot showing the used colors. This is the first in a series of posts that will highlight some neat tricks you can do with Quick Tiles. The first tip we’ll cover is a method to tint images different colors. 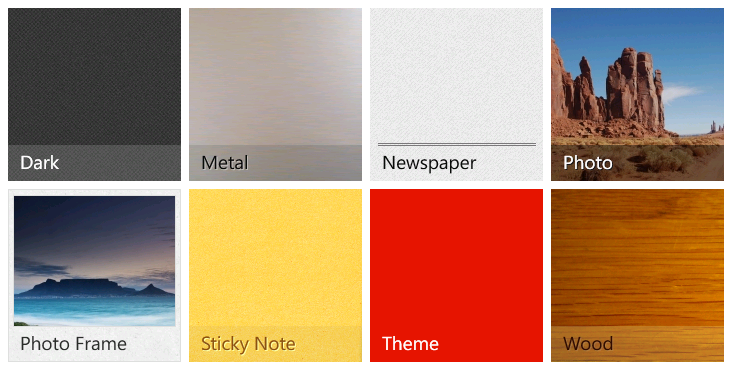 This lets you match a photo with the theme color of the rest of your pinned tiles. The first thing to cover are the Title Area Color and Text Area Color settings. These are two separate rectangles that are drawn right underneath any text. Here is an image showing what the two settings control. These colors can be set completely solid, or semi-transparent. Using the scaled background we can create a yellow tint to the top of the image and a red tint to the bottom of the image. The best use for these settings is to make text drawn over an image more readable. In the first image the white title has a low contrast with the snow in the photo which makes the text very hard to read. By applying a black Title Area Color with 70% opacity, we can make the text much more readable. One thing to note is that the colors will blend with the colors of the photo. So if the photo you are using is very colorful, you may not get the desired effect. To help correct this you can convert the image to black and white before tinting it. By applying the Image Effect -> Grayscale to the image before applying the Text and Title Area Colors, you can get the best results. The following image shows the original photo, the black and white version, and then some tinted versions. Upcoming Features, Bulk Template and Bulk Save. 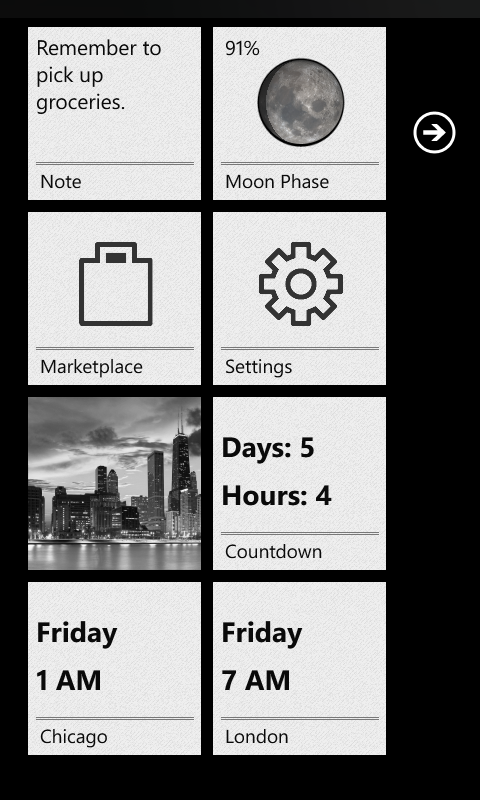 One of the goals of Quick Tiles is to help make cool looking themes on your phone as quick as possible. To help with this, a bulk template option has been added to let you apply a template to all tiles at once. You can also save all the changes in a single tap. These new features will be available in version 1.4 which will be added to the Marketplace soon. Background effects are texture styles that you can apply to a tile background along with the color. This lets you change the background to something a little bit more interesting than the stock solid color backgrounds. There will be more styles added later, but here is what is included in the first batch: Brick, Checkered, Diagonal Lines, Fleur-de-lis, Horizontal Gradient, Mosaic, and Radial Gradient. 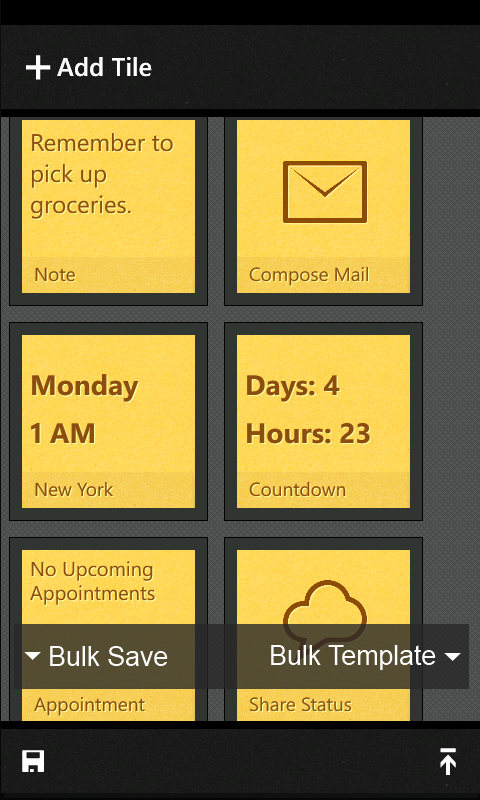 These styles are all pretty subtle so they add some variety yet don’t clash with the Metro UI design theme. An icon set that can be used with the Command tile type. Styling options work much like what is available with text. You can select any color for the icon and have options to set a shadow color as well. As the app is getting built out, a lot of settings are getting added to the interface. This is good in respect to what it lets you customize, but not so good in terms of the time it takes to style everything. 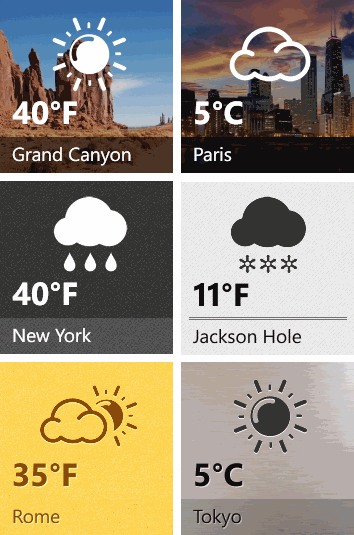 Tile templates are a new feature that lets you select from some pre-designed themes. Check out the templates and some screenshots of some home screens with the templates applied. 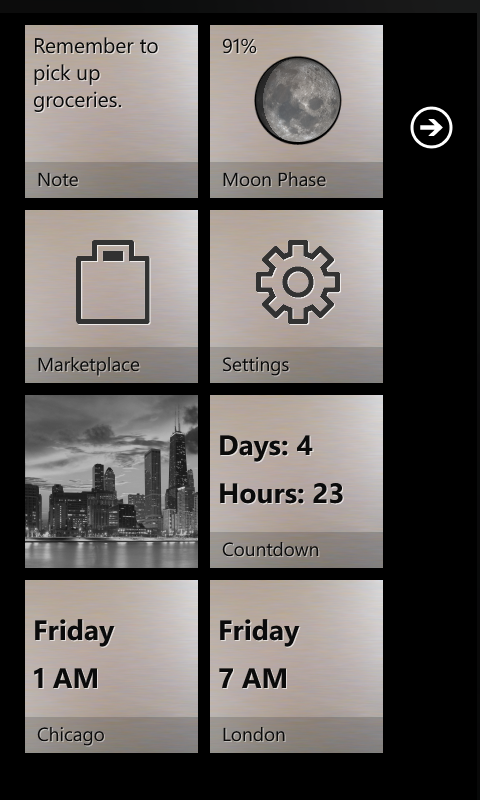 You can get the current version of Quick Tiles in the Windows Phone Marketplace, here. Welcome to the Korhaan development blog! This blog will host articles on our apps Quick Tiles and WordTilt as well as general Windows Phone 7 development.